Your choice of one handle only. No shaft comes with this handle. These are very slightly blemished and may have a scratch, ding, tiny dent, machine mill mark, spot, scuff or some other type of imperfection. 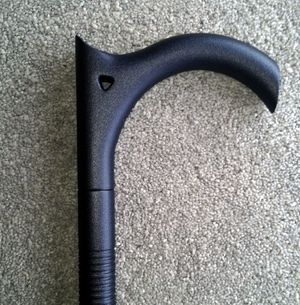 The T handle may be slightly overbuffed where the stem fits the shaft. 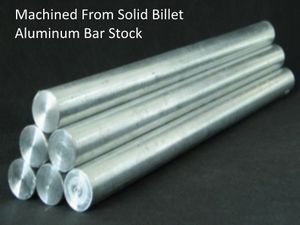 They are structurally sound, strong, no major defects and will interchange on any of the solid aluminum shafts. When purchasing, type the handle you want in the question box: Regular C, Edged C or Knob. Here are the handle sizes. The Regular "C" Handle is 5-3/4 inches wide, outside-to-outside with a 4-1/4 inch opening, and it's 3-3/4 inches tall. It is forged from solid aluminum and has an anodized finish. This is the "new and improved" C handle. 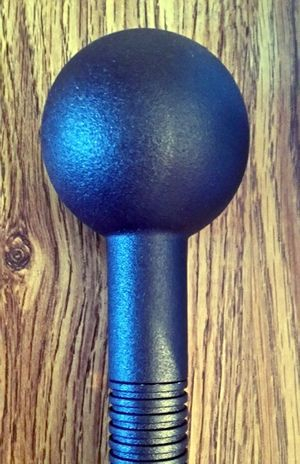 Edged C Handle - Our edged C Crook handle is a work of art and a masterful design that was inspired by many suggestions and ideas from cane users all over the world, many of whom are expert martial artists and cane handlers. It is solid, sturdy, comfortable and Very Effective! It measures 5 inches wide outside to outside with a 4 inch opening, and it's 3-3/4 inches tall, forged from solid aluminum with a clear, hard coat anodized finish. Which Handle Do You Want? - T Handle or Regular C Handle or Edged C Handle or Knob Handle?